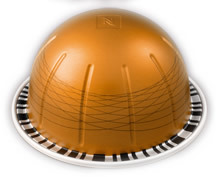 Nespresso Coffee Capsules are single serve aluminum coffee pods made to use in the Nespresso Coffee Machine. Nespresso is Nestle's version of the Keurig Coffee Maker and is marketed mainly in European markets although it is becoming popular in the USA as well. However, Nespresso was invented prior to Keurig. Each standard arabica capsule contains 5 grams of coffee which delivers 60mg of caffeine per pour and each Nespresso Lungo Capsule contains 6 grams of coffee for a caffeine content of around 83mg. Default pour size is: Espresso - 40mls, and Lungo (long) - 110mls. It's important to note that different blends could have more caffeine. Robusta varieties or blends will have a higher caffeine content. The caffeine range is 55-65 mg for Espresso and 77-89 mg for Lungo. The Kazaar blend has approximately 125 mg of caffeine per capsule. Nespresso Vertuoline are larger pods and can only be used with a Nespresso VeruoLine Machine. They contain more ground coffee per capsule than OriginalLine does. VertuoLine espresso varieties average 110 mg of caffeine per capsule. VertuoLine coffee varieties average 165 mg of caffeine per capsule. Vertuoline 1/2 caffeine capsules contain 70 mg of caffeine. Factors such as arabica and robusta blend as well as bean variation can affect the caffeine content. The actual caffeine range for VertuoLine espresso is 70-150 mg and 150-180 mg for Vertuoline coffee capsules. There are around 25 different Nespresso capsule varieties to choose from in their OriginalLine and as well as 13 varieties in their Vertuoline. 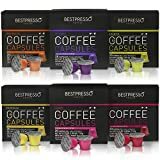 How Does Nespresso Coffee Capsules Compare? 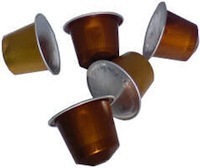 Nespresso Coffee Capsules contains 44.44 mgs of caffeine per fluid ounce (150.28mg/100 ml).